Jim Tigan has 32 years of experience handling raptors and has been a licensed Master Falconer for 27 years. 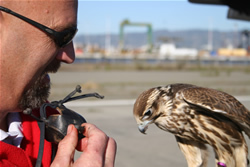 He founded the world-famous Alaska Raptor Rehabilitation Center in Sitka, Alaska, while stationed in the US Coast Guard. His extensive experience includes hawking and training more than 20 raptor species. Jim is the founder of Tactical Avian Predators (TAP www.tacticalavianpredators.com) which uses trained Falcons commercially. He has been working in falconry education for 20 years and as a full-time professional for ten years. Kathleen Tigan has trained several breeds of her working stock dogs and horses to actively participate in range land roundups. 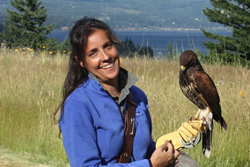 She worked as the Assistant Director of the Columbia Gorge Discovery Center in The Dalles, Oregon, where in addition to her administrative responsibilities, she initiated the Birds Of Prey program, which included developing raptor handling manuals, training volunteers, and managing the daily raptor demonstration programs. Kathleen is a licensed falconer and currently manages the TAP portion of the Tigan falconry enterprises. Visit TAP (www.TacticalAvianPredators.com) for details of the Tigans’ Integrated Pest Management company. James and Kathlee were recent guests of a member of the United Arab Emirates royal family at the World Falconry Meet in Dubai. Together, they have appeared on two episodes of Mythbusters and many other TV feature stories. Entertaining and charismatic speakers, they are both in much demand as educational presenters.